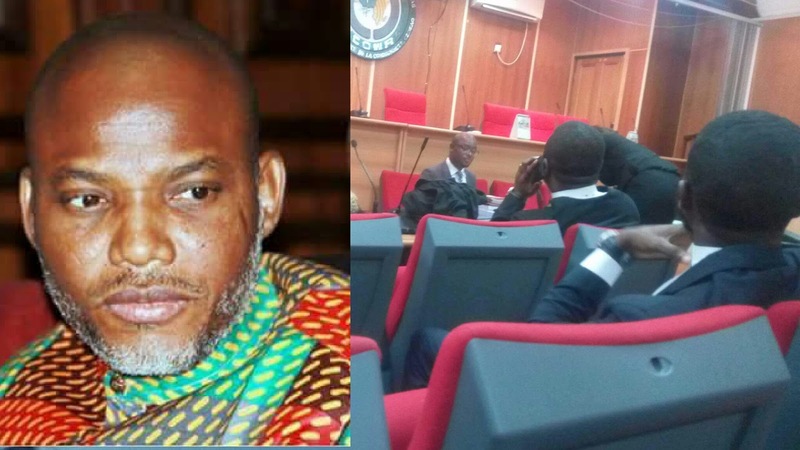 ABUJA— The ECOWAS Community Court of Justice, today, entertained a lawsuit filed by the leader of the Indigenous People of Biafra, Mazi Nnamdi Kanu, bordering on the abuse and violation of his fundamental human rights and his illegal detention against the Nigerian government, and to be awarded a sum of Eight Hundred Million Dollars ($800,000,000) as damages for violation of such rights. The court proceedings began at 10am, shortly after the arrival of the plaintiff’s lawyer, Barrister Ifeanyi Ejiofor and three-man panel of judges involving Hon. Justice Micah Wright of Liberia, Hon. Justice Yaya Boiro of Benin Republic and Hon. Justice Alioune Sall of Senegal. The justices in their rulings dismissed the various applications filed by the Federal government of Nigeria demanding the striking out of the suit on grounds that the regional court lacked the jurisdiction to hear the case. The Court however disagreed with this position, stating that it has the jurisdiction to entertain the suit since it is bordered on the enforcement of human rights of the applicant and thus dismissed the application of the FG for lacking in merit. Further submissions of the plaintiff’s lawyer was also declined by the court who affirmed it is vividly clear in this case that the Nigerian government are not able to defend the lawsuit filed against Nnamdi Kanu and that they will be no longer allowed to delay the suit as they urgently want an end to it and the detained freed unconditionally as ordered by previous Nigerian courts. The judges in what seems to be a final opportunity to allow the Federal government to tender a valid and genuine reason why the Applicant, Nnamdi Kanu should not be granted bail, adjourned the case to 27th April, after which it will then strike out the case as they have threatened. From all indication, it seems that the Ecowas Court does not want the FG to be outrightly disgraced. It appears to be giving her enough time to rediscover her senses and do the needful but like a stubborn fly that is hellbent on following the corpse to the grave, the FG seems to be road railed to her damnation. Biafrans are over 70million people and they have all it takes to be on thier own. The Biafrans should be allowed to control their Economics and Political future. Biafrans have every right to be free from the evil contraption called Nigeria. Unity is not by force. To register my deserved tribute to Engr. Uche Okafor-Mefor and all the technocrats in IPOB leadership for way and manner you execute the Government of IPOB home and abroad which have left the enemies wondering. Like l was saying before since my close to seventy years of existence on earth l have never heard or seen any political agitation seen in IPOB & agitation happening at the same time in about eighty countries of this worth. It's Biafra restoration and the world must know about us and our brand. May the ECOWAS Court give their verdict to the shame of the enemies who have been blinded by greed and wickedness. May keep our leader and all Biafrans wherever they are on the face of the earth in Chukwu Okike Abiama's name Iseee!